"This traditional Japanese yakisoba noodle dish includes cabbage and chicken in a spicy sauce." Heat 2 tablespoons canola oil and sesame oil in a large skillet over medium-high heat. Cook and stir chicken and garlic in hot oil until fragrant, about 1 minute. Stir chile paste into chicken mixture; cook and stir until chicken is completely browned, 3 to 4 minutes. Add soy sauce and simmer for 2 minutes. Pour chicken and sauce into a bowl. Heat 1 tablespoon canola oil in the skillet over medium-high heat; cook and stir cabbage, onion, carrots, and salt in hot oil until cabbage is wilted, 3 to 4 minutes. Stir the chicken mixture into the cabbage mixture. Add noodles; cook and stir until noodles are hot and chicken is no longer pink inside, 3 to 4 minutes. Garnish with pickled ginger. 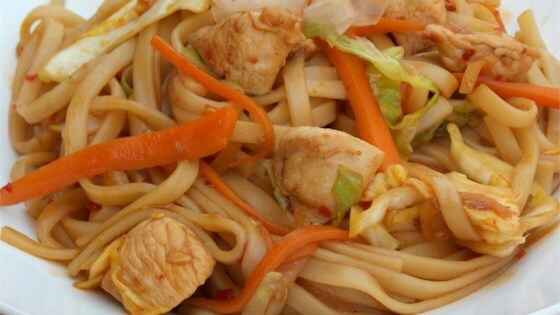 See how to make Japanese yakisoba stir-fry with chicken. Sorry, but it was VERY bland! I was really looking forward to trying this but was very disappointed...ended up smothering it in sweet Thai chili sauce just to get some flavor! This is awesome! I've made it twice in the last two weeks. Couldn't find Yakisoba noodles so I used thick spaghetti noodles...turned out great! Great recipe. The only change we did, was to only add a tablespoon of Sriracha Hot Chili Sauce instead of the Asian Style Chili Paste. Just enough kick. Enjoyed it a lot.